Our skeletons hold tell-tale signs that show that human bipedalism – walking upright and on two feet – are unique to humans especially when compared to our closest living relatives, apes. Exactly when these signs first appear in our evolutionary history is one of the fundamental questions driving the study of human evolution, or Palaeoanthropology, today. An interdisciplinary team led by scientists at the University of the Witwatersrand in Johannesburg, South Africa, has combined visualisation techniques, engineering principles, and statistical analysis into a powerful new way of analysing the structure of long bones. In the initial study, titled Cortical structure of hallucal metatarsals and locomotor adaptations in hominoids, and published in the open access journal PLoS One, the group of scientists documents foot differences between living humans and other apes that will be a starting point for their future studies investigating how far back in our evolutionary history the modern human pattern of bone structure in the hallucal metatarsal emerged. The study was undertaken by Drs Tea Jashashvili and Kristian Carlson from the Wits Evolutionary Studies Institute (ESI), Mark Dowdeswell, a senior lecturer in the Wits School of Statistics and Actuarial Sciences, and Dr Renaud Lebrun, a research engineer at the French Institut des Sciences de l'Evolution de Montpellier. In addition to offering crucial evolutionary insights into the timing and appearance of modern human gait, this method will significantly advance the study of bone biology and functional morphology in hominin fossils. "This approach shows tremendous research potential for bone biologists and functional morphologists, particularly those interested in limb structure," says Jashashvili. For the initial study, the team focused on the shaft of the foot bone that is connected to the big toe, otherwise known as the hallucal metatarsal, in groups of modern humans, gorillas and chimpanzees. The big toe, or hallux, plays a pivotal role during the propulsive phase of walking and running in humans. In other living apes the big toe is more thumb-like in facilitating grasping capabilities that are advantageous during climbing and other arboreal behaviors. By combining two previously developed methods – the colour map technique that allows structural patterns to be visualised; and the penalised discriminant analysis that allows for these patterns to be quantitatively tested - the approach of the team provides a comprehensive way of documenting structural differences related to these different uses of the hallux. By adapting and applying these techniques, the team is able to identify areas of maximum contrast in shape and size (morphometrics) between the modern species – basically rendering 2D-images from 3D CT-scans to create a "colour map" where each colour expresses different quantities of specific properties. "This study is an exemplar proof-of-principle analysis for a technique that can advance the general fields of bone biology and functional morphology by introducing a powerful new means of analysing long bone shafts, particularly their structural properties. In our first study, we have documented exciting structural differences between humans, chimpanzees, and gorillas, some of which were predictable based on their gait differences. The unexpected structural differences we observed are equally intriguing. We are eager now to begin examining how far back in evolutionary time these differences can be traced," says Carlson. "In biological research, such as genetics and brain studies, it is increasingly common to address questions using data derived through the discretization or partitioning of underlying processes. The continuous nature of tubular bones in living beings, for instance, is a good example of how visualisation of patterns can provide different information on form-function relationships in order to distinguish between the groups and the variations expressed within groups," says Dowdeswell. 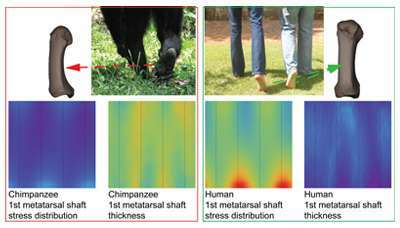 Do metatarsal cortical bone thickness and properties measuring resistance to bending (e.g., second moments of area) between humans, chimpanzees and gorillas reflect how each group uses their feet during observed or reported locomotor repertoires? Within each group, are there diaphyseal regions where lower structural variability is expressed and can these regions be spatially distinguished from regions of higher structural variability? In addressing these questions, the researchers have provided new insights into the evolution of hominoid feet, organisation of the structural integration of bone, and advanced the use of colour maps in visualising continuous thickness distributions. Collectively, this offers the potential to better understand functional morphology of long bone diaphyses.